One day your swing is great. The next day it seems to fall apart. Inconsistency is the number one complaint I hear from golfers, and can be the single biggest cause of diminished enjoyment. Those of you who are facing another hard northern winter and forced hiatus from golf would probably like to maximize the time you have left in your golf season. If you got off to a bumpy start this summer, there’s still time to salvage your pride and your game by instituting some easy strategies to align your thinking with success, which will lead to better rounds. There’s no simple answer for why your golf game has peaks and valleys. It could be that you haven’t fully integrated some new swing changes. Perhaps you’ve never done the work to develop the right thought habits that lead to consistent play. Or maybe you’re setting your expectations too high, resulting in extra tension and pressure to post a “respectable” score. The worst thing you can do when things take a slight or dramatic turn is to panic, yet that seems to be where many golfers go. They head to the practice range for a 2-hour grind. They try 5 different approaches to “fix” their swing. They stress about whether or not this new trend is going to follow them for an extended period of time. They turn what is probably a temporary setback into a long-term issue. If this sounds familiar, now’s the time to change your approach to get more out of your game than further pain. Relaxing about the fickle nature of the game is your best opportunity to play through the rough patches. You know that the more anxious you become mentally, the more your body will respond with tension physically, making a simple glitch even worse. 1. Recall the great moments — Just because your swing feels a bit off today does not mean that you’ve somehow “lost it.” Remind yourself what it feels like to swing correctly. 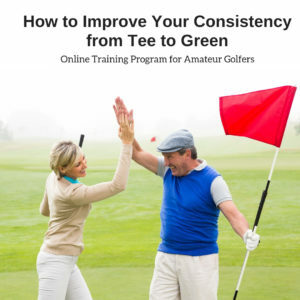 Work on reengaging that feeling off the course, and on the practice range without a ball. Sometimes you just need to take the ball and the outcome out of the equation in order to redirect your focus and your thoughts to your process. Replaying the bad shots in your mind is just as bad as physically hitting them over and over. 2. Don’t forget to breathe — The tighter you get, mentally and physically, the harder it will be to swing with fluidity. Calm yourself with some simple breathing in and out while imagining yourself hitting the shots you desire to create. 3. Avoid taking an all or none approach to your game — Golfers who see their game in black and white — everything’s good or everything’s bad — find it very challenging to play consistently because they’re often on the hunt for the “perfect” shot. There is no perfect in golf, so approaching your game with this rigid standard simply sets you up for defeat. Start to take note of the gray area between good and bad, and change your terminology from bad to less than ideal. The point is that no matter where a shot lies, you have to play it. So why not look at a less than ideal shot as an opportunity to see how creatively you can get the ball back in play. 4. Take a day off — If you are the type of golfer who tends to work harder and harder, especially when things aren’t going well, perhaps the best course of action is to simply take a day off from the game. And when I say take a day off, I mean completely. During this time you won’t talk about your game, think about your game, watch golf on TV, or read about it. Instead, you will completely switch gears and do something else you find fun and relaxing, so that you can return to your game with a fresh perspective. I find myself going through a checklist of things I need to remember before hitting each shot. Is that detrimental rather than helpful? Hi Gail! Thanks for your great question! It sounds to me like you don’t have a concise pre-shot routine that is creating a solid sense of trust with which you address the ball. A good pre-shot routine enables you to shed the weight of too many thoughts, by settling on just the small list of factors that are essential for hitting consistently solid shots. If your checklist of items centers around technical swing thoughts then you are operating with training wheels on your swing, and yes, that is detrimental. When you trust your mechanics you aren’t constantly trying to remind yourself how to swing the club and hit the ball. I highly recommend you swap those checklist items for a “feel” cue that quiets and centers your mind BEFORE you address the ball. Secondly, you want to make sure that at address you aren’t repeating steps that you’ve already completed in your routine. Planning must take place before you step into any shot so you may address and execute with a singular focus on the target.